When a HomeVision schedule file is lost because of a computer crash or just plain carelessness, the HomeVision controller is still running the program. So obviously most of the schedule must still be present in the HomeVision controller. The problem is how to convert it back into a usable format. While writing the Linux HomeVision software I gathered quite a bit of knowledge about the memory layout of the HomeVision controller. So after a cry for help from an unfortunate HomeVision user who experienced the described situation, I decided to try to convert a memory dump back to a usable schedule file. When this turned out to be reasonably successful, I thought more people might have a use for such a tool. So I put a bit more effort in to make the tool capable of retrieving the necessary data from the HomeVision controller itself and I added a simple user interface. Linux, a 32 bits Windows version, or Mac OSX (PPC or Intel). The appropriate Tclkit or the ActiveTcl binaries for your platform. Object names that were not selected for loading. All but the first 16 characters of object names that were selected for loading. Also configuration settings that are not stored in the schedule file are not being recovered although some could be if there would really be a need for it. I don't think there is such a need, but feel free to try and convince me otherwise if you don't agree. Download version 1.10 of recoverhaf.kit (size: 81517 bytes) file and place it at any location you want. Just execute tclkit recoverhaf.kit. If your tclkit executable is located in your path, you can even make the script executable and run it. If you are using the ActiveTcl binaries, execute wish recoverhaf.kit. Double-click the recoverhaf.kit file. The first time no associated program will be known for this extension, so an "Open With" dialog will appear. Choose your tclkit or ActiveTcl's Wish as the program to use for opening the file. Check the "Always use this program to open this type of file" option to keep this association for future invocations. The "Settings" menu contains only one entry called "Serial port". By selecting it a new window pops up that allows the selection of the serial port and baudrate to use for the connection to the HomeVision controller. At the moment the program only supports the four basic serial ports. After the serial port has been configured, click the "Start" button or select the "Start" entry from the "File" menu to start the recovery process. 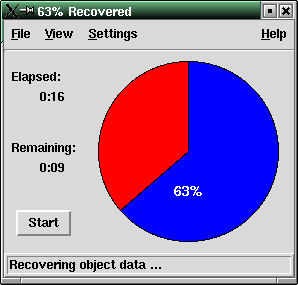 The progress of the recovery process is represented in a pie chart. When all the data has been retrieved from the HomeVision controller, it is converted to a .haf file. Any errors and warnings that were encountered during the conversion will be displayed. After the user closes that window, or if there were no errors or warnings, a dialog pops up to allow the user to save the file. The initial file name displayed will be the name of the file that was originally loaded in the controller, but the user has the opportunity to change the name before saving the .haf file. So, no harm will be done to your existing schedule if you would like to try out the tool even if you haven't yet lost your schedule. This could be useful if your schedule behaves different from what you expect. You could recover the schedule from the controller and check that it really contains the actions you thought. If you find any bugs in the program, please report them to me. My email address can be found on the about screen accessible from the "Help" menu.